JA Clift specializes in supplying and installing custom designed granite kitchen tops, granite and marble vanity tops and various other countertops. 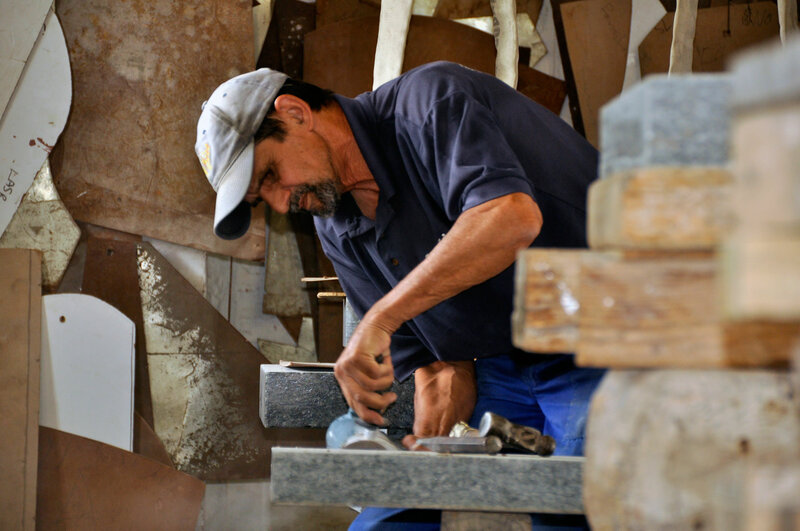 All our products are handcrafted by qualified artisans from high quality stone. We have extensive experience in crafting a wide range of stone products including tabletops, work surfaces for restaurants, tiles for interior as well as exterior surfaces, garden features, as well as traditional fireplaces and hearths. JA Clift’s offices, showrooms and factory are situated in Concordia Street, near Paarl Station. Our masons’ yard in Concordia Street, Paarl is is more than 8 500 m2 in size and is equipped with some of the most technologically advanced stone working equipment available. We are able to source a very high quality Paarl Grey granite from our own quarry on the slopes of Paarl Mountain. Large Nordiax saws are used to cut quarried blocks into smaller more manageable pieces. The masons’ yard houses a range of skilled artisans including draughtsmen, stone cutters and polishers, masons and engravers. All the work is closely supervised to guarantee that every product that leaves our yard meets our highest quality standard. We specialize in supplying custom designed granite kitchen tops, granite and marble vanity tops and various other countertops. All our products are handcrafted by experienced artisans who take pride in their work. We install granite products throughout the greater Western Cape, Boland, West Coast areas including Cape Town, Somerset West, Stellenbosch and Worcester. JA Clift works as a preferred contractor with property developers and architects to supply granite countertops to luxury residential developments such as Val de Vie (Franschhoek), Boschenmeer (Paarl) and Erinvale (Somerset West). Our company has supplied dimension stone for the building industry for more than a century and able to provide valuable consultancy services when heritage buildings and national monuments require restoration work or when they are refurbished. We were original contractors on a number of Cape Town’s heritage buildings, including the Houses of Parliament, the Old Mutual Building, the General Post Office, National Mutual Life Association of Australasia, FNB Bank as well as projects in St George’s Mall precinct. Projects in Paarl included the Town Hall, FNB Bank, the KWV Head Office, the Toringkerk Church Hall, the Board of Executors’ Building, Boys’ High School and La Rochelle Girls’ School.